The "English Sixteen" puzzle is peg jumping puzzle that is essentially a two-dimensional analogue of the Leaping Frogs puzzle. The board has two 3×3 grids of holes which share one corner hole. Initially the shared hole is empty, and the rest is filled with eight pegs of one colour in one half of the board and eight pegs of a second colour in the other half. You are allowed to shift a peg to an adjacent hole, or you can jump a peg over another if the hole is immediately behind that. The aim is to swap the colours, moving every peg to the other half of the board in as few moves as possible. This puzzle is described in Professor Hoffman's "Puzzles Old and New" from 1893. A peg is only allowed to shift/jump forwards, not backwards. A peg may only jump a peg of the other colour, not one of the same colour. These restrictions are essentially the same as draughts/checkers, so sometimes this version of the puzzle is played on a checkered board with pieces on the black squares. 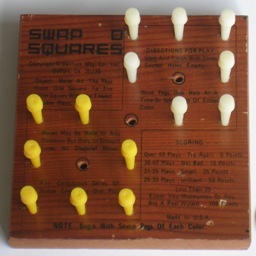 Swap Squares is a version of the puzzle which starts with only 7 pieces in each half - the centre hole of each 3×3 grid is initially left empty. The same restrictions may be applied if you wish. Note that in this game it is possible to shift/jump one piece several times in succession. You may wish to count multiple consecutive shifts/jumps with one piece as a single move, or only count consecutive jumps as a single move. If there are no restrictions on the moves, then it is easy to calculate the number of positions. There are 17 holes, and 8 pegs of each colour, giving a total of 17!/8!2 = 218,790 positions. If only forwards moves are allowed, then many of these positions are unreachable. It is difficult to calculate the number directly, but a full enumeration by computer showed there are 133,864 reachable positions. In the 14 peg game, 7 pegs of each colour and 3 empty holes, giving 17!/(7!23!) = 2,333,760 positions if there are no restrictions on the moves. If we restrict to forward moves only, then there are 2,071,392 reachable positions. Choose the way you want to count the moves below to see the relevant tables. Without the restrictive rules, the optimal solution is 46 moves (20 shifts and 26 jumps). Unsurprisingly, there are no backwards moves, so the first restriction makes no difference. More surprising is that there are such optimal solutions where jumps are only performed over pieces of the opposite colour. The second restriction therefore also makes no difference to the length of the shortest solution (although there are more optimal solutions if you do not impose the second restrictive rule). Suppose we only apply the first restrictive rule, so moves are only forwards, and there is no restriction on the colours of pieces we jump over. In this case there are solutions which are optimal whichever way you count the moves. It has 38 shifts/jumps, 24 moves when only consecutive jumps with the same piece are combined to one move, and 18 moves if consecutive shifts/jumps of the same piece are also combined. On the other hand if both rules are in effect (forward moves only, jumps only over opposite colour), then the solutions are all slightly longer - 41 shifts and jumps, 31 if consecutive jumps are combined, and 21 if consecutive jumps and shifts are combined. The solution below is optimal in the first two metrics, and the solution below that in the third metric. There is probably no single solution that is optimal in all three.